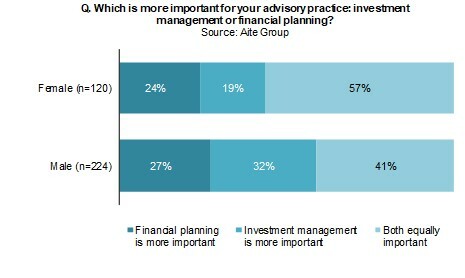 Female advisors firmly believe in financial planning or in financial planning combined with investment management. Boston, January 30, 2019 – The daily life of a financial advisor is shifting, and revenue opportunities, client management, portfolio management, products, and technology tools are changing at unprecedented speeds. Against this industry and societal backdrop, female visibility, leadership, and advancement in business are gaining attention. Is there room for female advisors to advance in financial services? This report provides context on the female advisor experience today in order to track her progress going forward. It is based on Aite Group’s annual online survey of approximately 300 to 400 U.S. financial advisors across a wide range of wealth management firms and includes survey results from 2013 (403 advisors) and 2017 (344 advisors). This 61-page Impact Report contains 30 figures. Clients of Aite Group’s Wealth Management service can download this report, the corresponding charts, and the Executive Impact Deck.